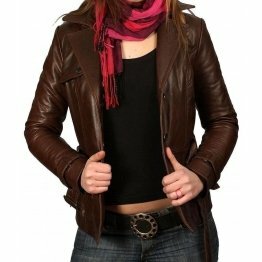 Stylish womens genuine lambskin brown leather motorcycle jacket is promoting your biker style with fashion sense.Beautifully crafted in brown leather,this moto jacket has symmetric zip fastening with notched collar,long sleeves with zip cuffs and front fuctional zip pockets. 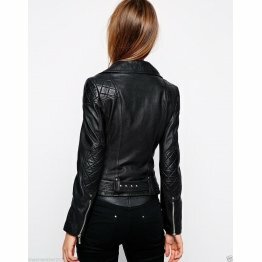 ..
Are you interested in buying genuine real leather Jackets for womens? 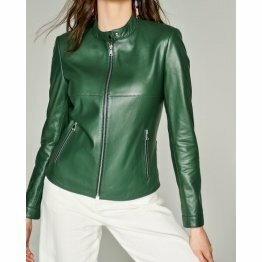 ZippiLeather online leather clothing store has stunning collection of leather jacket women for all purposes whether you want to keep yourself warm or use it for riding a bike. They come with different lengths and sleeves; some come with long sleeves, short sleeves while some are sleeveless. 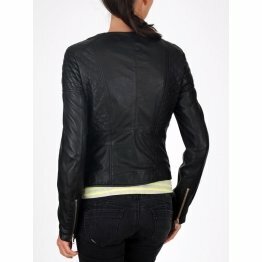 You can go through a wide range of real leather jackets womens and pick one that matches your feminine style. 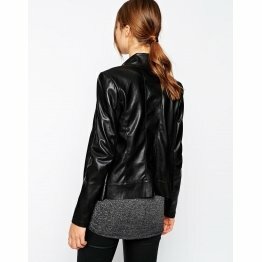 Women's jackets come with zip sleeves is the perfect one to fit feminine curves. 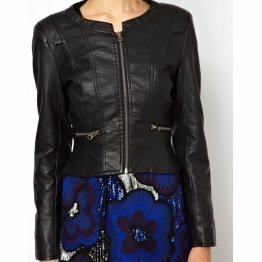 It is made of faux leather and is fully lined. 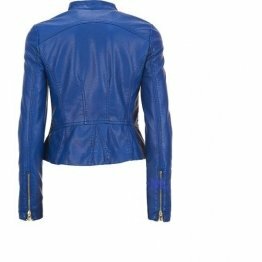 It has studded lapels,asymmetric zip fastening and side pockets.It is made of 86% polyester,8% viscose and 6% cotton and can be easily washed in a machine. This can be used on top of a dress or pants to keep you warm. 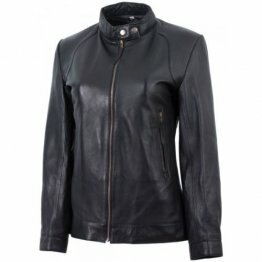 Are you a women-biker who likes to tour the countryside on your motorcycle? 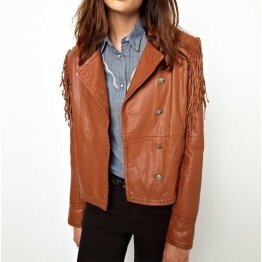 Then a suede biker jacket is the one for you. 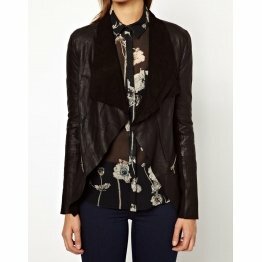 It is made up of soft touch suede with notch lapels and asymmetric zip fastening. 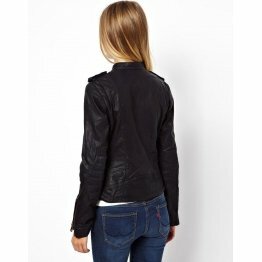 The motorcycle jacket s have functional pockets and zipped cuffs. 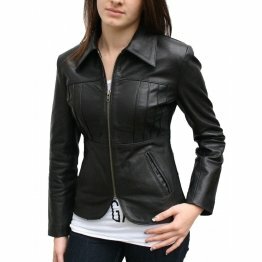 Leather jackets for women are 100% genuine leather and has lining of polyester and cotton. 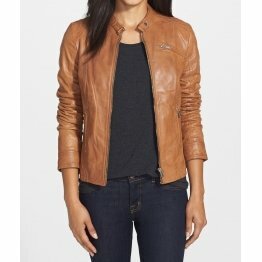 This cool leather jackets womens has striking look but requires professional leather cleaning if it gets dirty. 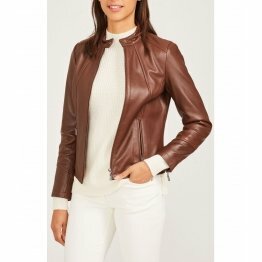 Women Bomber Jacket is the latest trend this season and fits close to the figure. 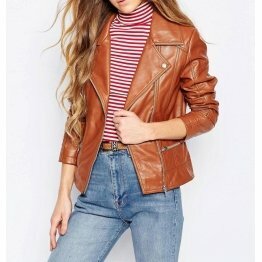 It has long sleeves with a front zipper. Purchase bomber jacket which is made from 100% cotton fleece and pre-washed for a softer texture. It is an ideal combination of chic and comfort. 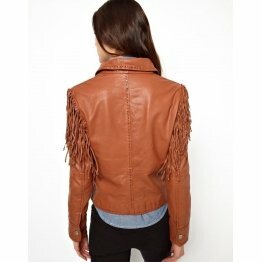 You can order them in different colors like tan, black, dark brown, pine green, navy blue and others. 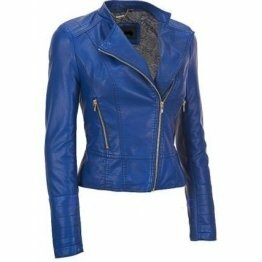 The glamorous leather jacket women is made of lambskin with a collar framing the face made of luscious faux fur. It has adjustable button tabs on the side to help adjust the fit. 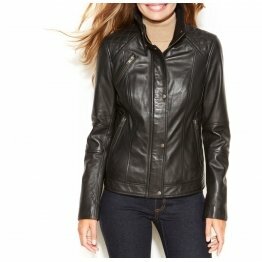 Women’s leather jackets are 23” in length with front button closure and long sleeves with button cuffs. It is unlined with chest pockets made of welt. The faux fur collar is 70% modacrylic and 30% acrylic. It requires professional leather cleaning. 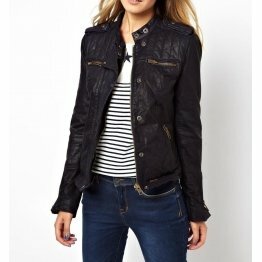 This ladies jacket will add a panache to the apparels and have heads turning when your ride past. Are you a regular motorcycle rider or one who likes to ride in your spare time? 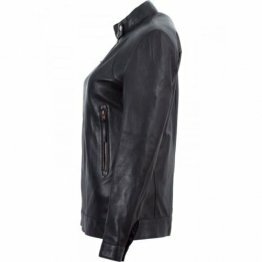 If you are one who like to go out with motorcycle on the weekends than hooded leather motorcycle jacket women is very essential to protect you and to provide you warmth. 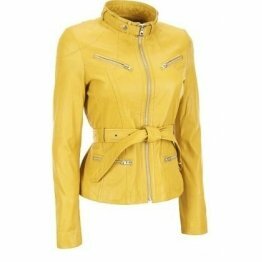 It is designed with snap fastening epaulettes and lapels,zipped cuffs and four pockets in front with zips besides two side pockets with zips. 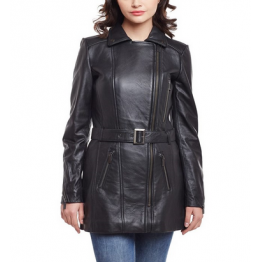 Leather jackets for womens has paneling, belt loops and buckled belt besides ribbed trims. It is fully lined and has zipped front. 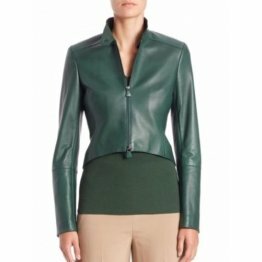 It is crafted from 100% lambskin with lining of 35%cotton 35%wool and 30% viscose while the lining of the sleeves is 100% viscose. 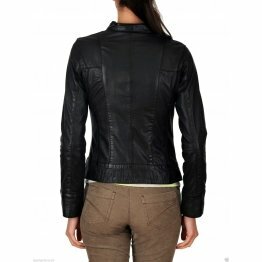 It is ideal for slim people with non- stretchable leather with stretchable panels. It has to be dry cleaned when dirty. There is nothing like a designer blazer to stand out among your friends. 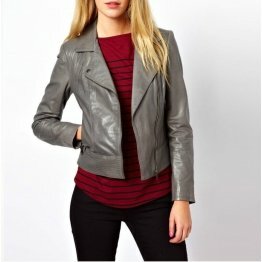 It is available online in grey brown black and burgundy. 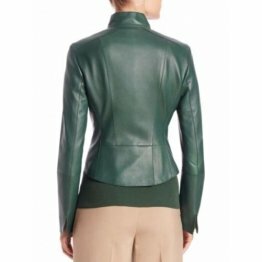 A flattering silhouette is sculptured in a wool blend blazer with princess seams and waist darts. It has rag and bone Waterbury buttons for signature. 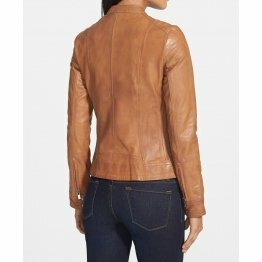 Women’s leather jackets have notched lapels revealing supple leather on the underside of the collar. 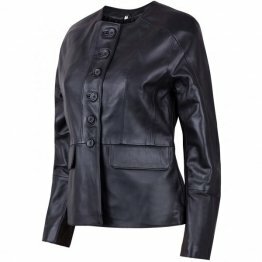 Leather jacket women is 28” long with button closure and long sleeves with single button cuffs. In front it has welt pockets and ticket pockets. It has a vent at the back and is fully lined. It needs dry cleaning when soiled.